The story of Ryan McHenry proves that there's value in an engaged audience. Until this week, the name Ryan McHenry might have had little meaning to a majority of the people surfing the internet. But to nearly 255,000 people – he was a creative genius worth following. In 2013, McHenry’s creativity gave birth to the internet sensation “Ryan Gosling Won’t Eat His Cereal.” While the five-second Vine videos are simplistic and don’t endorse a particular brand, they did help skyrocket McHenry to internet fandom, which in this day and age is increasingly valuable. Later in 2013, McHenry was diagnosed with osteosarcoma, a disease that would eventually spread to his lungs. While in his hospital bed, he presented his Twitter followers with a Photoshop challenge: take his bald #chemoselfie and add any hairstyle. The results came in droves, proving one thing – not only did McHenry have a large following, but he had a large engaged following. Brands need content creators like this. Imagine for a second if Kellogg’s, Post, or General Mills had initiated a conversation with the Vine star, partnering with him to create a video where Ryan Gosling refuses the competition’s cereal. Would the campaign run its course eventually? Sure, but that’s how social media works anyway, isn’t it? This is only a microcosmic example of the potential Organish™ marketing opportunities that exist for brands. There is a whole connected world out there, where brands don’t need to do the talking. Instead, they should let the trusted voices of the social space speak for them. It literally could be as simple as dropping a spoon. The most impactful piece of this whole story lies with Ryan Gosling himself. 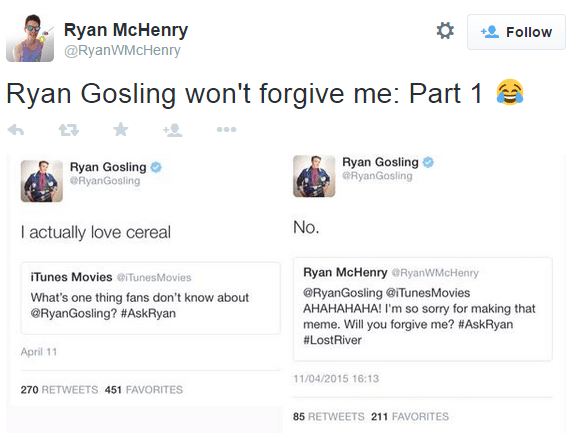 On several occasions, interviewers have asked Gosling about his views on cereal. Something so seemingly insignificant had become a meme with global recognition and even started a small beef between Gosling and McHenry – whether for fun or not. This is Gosling’s only Vine video. He presumably made his account in order to respond to McHenry’s death. Currently, it’s looped over 30.6MM times – increasing at a rate of about 50 loops per second. That’s the true value of a content creator.